Chronicle -- Whilst Prof. Mills was busy waging his clenched teeth campaign, his party's General Secretary was busy drinking Scotch Whisky at East Legon with top Officers of the New Patriotic Party (NPP) at a meeting where he lambasted senior party officials, announced his intended resignation and revealed guarded party secrets. Unknown to him, the NPP top guns who appeared to be excited about the drama secretly recorded the meeting and released it to Choice FM, a local Radio Station in Accra after the NDC began murmuring that the NPP was trying to poach their scribe with cash. Dr. Josiah Aryeh who has been complaining recently that his chop money and cash for running his office as General Secretary is small was heard on the tape narrating how he hasn't been paid for a long time and how he was being starved financially. On the tape, the NDC scribe is also heard narrating how his party had swerved him from touching cash given to his office party by the Institute of Economic Affairs (IEA). “I don't have any cash, I don't have petty cash, I don't imprest I don't have anything. So you wonder” Dr. Aryeh said. He added that the last time he got money from the NDC was in April this year when he was given ¢2 million during the registration excercise. From there, Dr. Aryeh proceeded to plan how to exit the NDC. He said his plan consisted of two stages and that the first stage which was his resignation depended solely on him. The second stage was to hold a press conference to tell his story and possibly throw some hard punches against his party as is usually with the case of people who defect in critical times such as this. “There are two stages, the first stage depends on me, I can handle that, You know the Ghanaian mind is such that when you leave one political party and joins another the people might not necessarily understand. Dr. Aryeh said on the tape. But he received some quick words of advice from the senior NPP officials who told him to maintain a poker face. The ecstatic NPP top guns reacted to the good news and immediately promised that they could arrange the necessary security if he so wished to ensure that he does not suffer any harm after his move. Continuing with his revelation, Dr. Aryeh noted that there had been several instances when he had been sidelined by senior officers of the party like Obed Asamoah and cited specific instances where Ex-President Rawlings had to step in to allow him to speak at NDC functions. He mentioned the launch of the NDC Manifesto in Kumasi, the Cape Coast and Mantse Agbonaa rallies as instances when his name has disappeared from list of speakers at NDC rallies. Meanwhile, Chronicle has gathered that Dr. Aryeh visited the home of Hon. 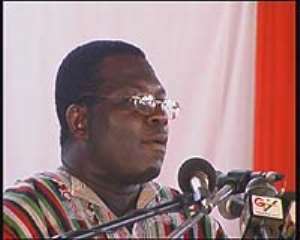 Kwamena Bartels to talk about his intended movement from the NDC twice. When Chronicle contacted Hon. Kwamena Bartels yesterday he admitted that Dr. Aryeh visited his house with two friends, Paa Nii and another unnamed friend.